When I first saw the collection Paper Obsessed by Crimson Tate for Windham Fabrics, I knew it was a must have for my Go-Go Studio! The simple paper lines in the note pad prints and whimsical paper airplanes represent everything that is amazing about paper! Paper is an essential in a creative life! Doodling, lists, brainstorming, notes and letters or just making paper airplanes with your little one for enjoyment. I dove into my Aurifil stash and found these lovely 50wt threads to match up with the collection. This match up includes ( from left to right) 2021, 2270, 2115, 4655, 2715, and 2605. Aurifil has now made available the plastic cases for purchase. The case can hold 12 large spools of Aurifil thread. Check with your local Aurifil shop to see if they are carrying this very useful item. If they are not, request them! They are a great way to store and keep your thread stash dust free and safe! The fabrics in Paper Obsessed are not overly bold, so they can be paired with just about anything making them very useful. The projects that can be made could be for any gender or age. Very useful indeed! I am also drawn to ( no pun was intended) the fussy cut potential of the notepad, stamp and paper airplane prints. 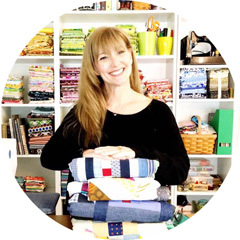 These fabrics are available at your local quilt shop ( I purchased mine at Kelly Ann's Quilting in Warrenton, VA) or on your favorite online quilt shops!